South Australian stars in home round at Murray Bridge. KTM Motocross Racing Team’s Kirk Gibbs has claimed the overall honours in the Monster MX1 class at the fourth round of the 2014 Monster Energy MX Nationals at Murray Bridge. Gibbs backed up some strong words during the week about his claim as a championship contender with a wonderful performance in the South Australian sand. The KTM pilot finished the day with a race win in the second moto which, when paired with his opening moto result of fourth place, was enough to give him a three-point round win ahead of CDR Yamaha rider Billy Mackenzie. Mackenzie was extremely consistent with two third-placings from his two races to finish ahead of National Pump Monster Energy Kawasaki’s Jake Moss (sixth and second from his two races). Round three winner Adam Monea (Monster Energy Kawasaki) finished fourth overall with an opening moto win before finishing 12th in race two, while series leader Matt Moss (Team Motul Suzuki) could only manage fifth overall with a fifth and sixth. After winning the Super Pole hot lap for the round and qualifying fastest, Monea was looking to continue his run of hot form. However it was Rhys Carter (Team Motul Suzuki) who took the holeshot in the opening moto – a lead that lasted seconds as Matt Moss charged to the front at the next turn. By the end of the opening lap with things settling down, it was Matt Moss in the lead from Cody Cooper (Penrite Honda Racing), with Monea in third. Local favourite Gibbs settled further back into seventh place further down the field, just behind Jake Moss. It was a tense and hard fought moto, and before long Monea managed to pass Matt Moss – a lead that he did not relinquish for the remainder of the race. Moss had problems throughout the moto, and was slowly picked off by his rivals – first Cooper, who ended the race in second and then Mackenzie, who battled his way through the field onto the podium. Moss and Gibbs had a fierce battle for fourth place over the last two turns of the race, with Gibbs narrowly edging out the reigning champ. While the first moto was full of mouth-watering action, the second saw little movement in race order once the opening lap was completed. Jake Moss steamed to the front of the field taking the holeshot, while disaster struck for Cooper who went down at the opening turn ending his day prematurely. It didn’t take long for Gibbs to stamp his authority on the race – into the lead by the end of the second lap and comfortably riding away to a memorable victory. As Gibbs took the lead, Jake Moss was relegated to second where he eventually finished with Mackenzie back in third place. Mackenzie rode the race in third to finish on the podium, while privateer Jacob Wright fought hard to finish in an impressive fourth, with DPH Yamaha’s Kade Mosig earning fifth place in the race. Matt Moss rounded off a disappointing day at Murray Bridge finishing in sixth place in the second moto. In the overall championship standings, Moss retained the outright lead but has had that whittled down to just 13 points from Gibbs. Monea is a further 22 points behind in third, with Jake Moss and Mackenzie rounding out the top-five. Round five of the 2014 Monster Energy MX Nationals makes its way to Wanneroo in Western Australia on 25 May. First career moto and round wins for popular South Australian. 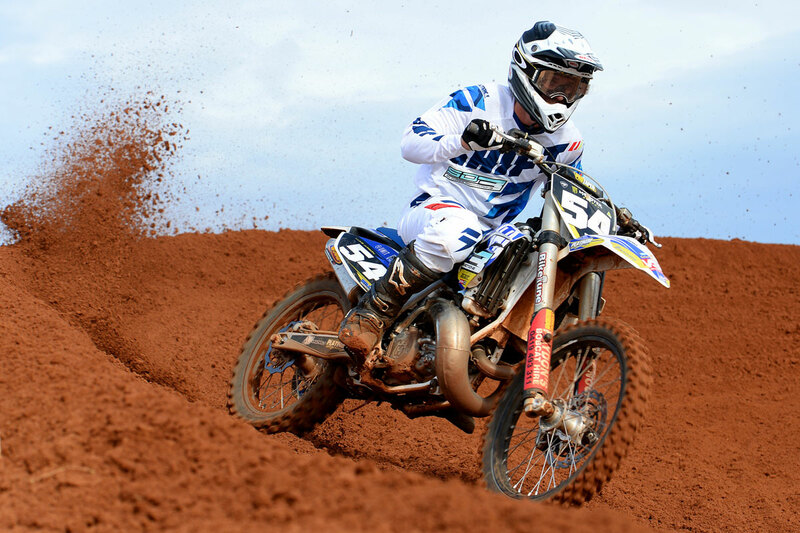 SD3 Husqvarna rider Luke Arbon has taken the round win in the Motul MX2 class at the fourth round of the 2014 Monster Energy MX Nationals at Murray Bridge in South Australia. In front of over 3500 spectators, Arbon was the standout performer in the MX2 class, backing up a second place finish in the opening moto of the day with a race win in the second moto. Instant Security KTM’s Brenden Harrison finished the event in second place (sixth and third in his two races) edging out Husqvarna Red Bull WIL Sport NZ Racing rider Kayne Lamont in third (first and 11th). Championship leader Luke Clout (Serco Yamaha) could only manage fourth overall on the day, finishing fourth and fifth in the pair of motos. In the opening moto, Lamont streaked the field to take the holeshot and move comfortably into the lead. It was an ominous sign for the Kiwi who was looking for a good round to make a move on series leader Clout – and it was just the start he was after. Lamont was followed at the first corner by Arbon and Tunetech Racing KTM Australia’s Kale Makeham, and the trio finished the race in the same positions. The only challenge to the order looked like coming from Clout who managed to pass Makeham into third in the second half of the moto, before he lost control and slipped back into fourth place, where he eventually finished. Harrison found himself in 12th position by the end of the second lap, but worked his way through the field nicely to finish the race in fifth place. In the second race of the day disaster struck early for Lamont who went down at the first turn, and could only manage an 11th place in the moto. 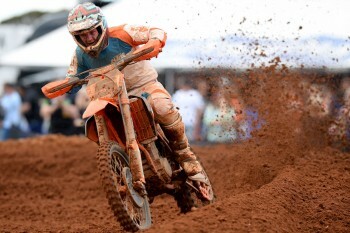 Caleb Ward rode his Wayne Leonard KTM into the holeshot, and managed to stay in first place for some time before being passed by eventual race winner Arbon. Arbon had been battling with Clout back in third and fourth before stepping it up to get into the lead and consolidate his brilliant round win. With Lamont having drifted down the field, Clout had an opportunity to peg back some important series points that he gave up to the kiwi in the opening race. He managed to pass Ward into second position before an unfortunate crash saw him drop back to fourth, and he eventually finished the race in fifth. Similarly to his charge in the first race, Harrison ended race two in third place after earlier finding himself back as far as 13th. Hamish Harwood (CMR Redbull KTM) finished the race in fourth. In the overall championship standings, Lamont, Harrison and Arbon all managed to close the gap on series leader Clout, who holds a 12-point lead over Lamont. Harwood is a further seven points behind with Harrison and Makeham rounding out the top-five.